For years, members of the Arab American Club of Knoxville have supported the University of Tennessee, Knoxville in a variety of ways – from gifts to the UT Medical Center and McClung Museum to several departments in the College of Arts and Sciences. The most recent gift will provide support for the new Middle East Studies program, an interdisciplinary program established in fall 2017. 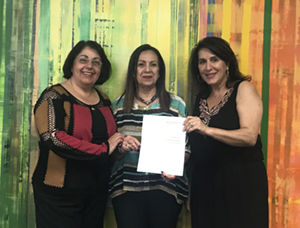 The Arab American Club of Knoxville Middle Eastern Cultural Engagement Endowment will provide support for projects focusing on the study of countries where Arabic is an official language in the Middle East. The endowment will also provide support for student outreach projects that help advance the public understanding of Arabic culture and Arab Americans, a key value of the Arab American Club of Knoxville (AACK). The program in Middle East Studies has study abroad opportunities for students who want to experience Middle Eastern culture. Unfortunately, students often do not have the financial means to travel for research or to study abroad. “This funding will be invaluable to making the study of the Middle East possible for students at UT and to making the Middle East Studies program more visible on campus and in the community,” says Tina Shepardson, professor and head of religious studies and outgoing chair of Middle East Studies. One of the many activities AACK members support at UT is the annual Arab Fest, which celebrates Arab culture and introduces students and the community to food, music, dance, clothes, and handicrafts from the Arab world. It all began when students from the UT Dig Jordan study abroad program returned to the United States in 2013 and wanted to share their cultural experiences with the UT community. They partnered with AACK and hosted the first Arab Fest in 2014. The festival continues to grow and is now in its fifth year. “The festival allows our local Arab American community to share the best of their culture and traditions, truly reflecting the rich diversity of Knoxville and the university, and provides an opportunity to recognize Arab American–owned businesses and organizations and for students, faculty, and volunteers to build relationships with the local community,” says Erin Darby, UT assistant professor of religious studies and Arab Fest co-coordinator. Members of AACK received the College of Arts and Sciences College Volunteer award, which recognizes exceptional service or long-term leadership to the college or to an academic department or program within the college. The AACK truly embodies the Volunteer spirit, modeling civic engagement to our students and helping the college fulfill UT’s mandate as a land-grant institution. They give of their time, money, and talents for one purpose – to enhance the cultural experiences of the UT student body and the greater Knoxville community.